Microsoft introduced Stream, a service that will allow businesses the ability to share internal video easily and securely. Now available as a free preview, Stream offers the same easy-to-use, flexible tools as YouTube, but with security tools for enterprise content. Office 365 already has a Video tool, and Microsoft’s idea is to eventually and seamlessly merge the two services. Unlike Office 365, Stream will make use of tools — including likes, comments, and recommendations — found in consumer platforms such as Vimeo and YouTube. TechCrunch reports that Microsoft says basic Stream use cases in the enterprise environment would be training and employee communications. Microsoft executive James Phillips reveals that, “all it takes to get started with Stream is an email address,” and does not require a credit card. 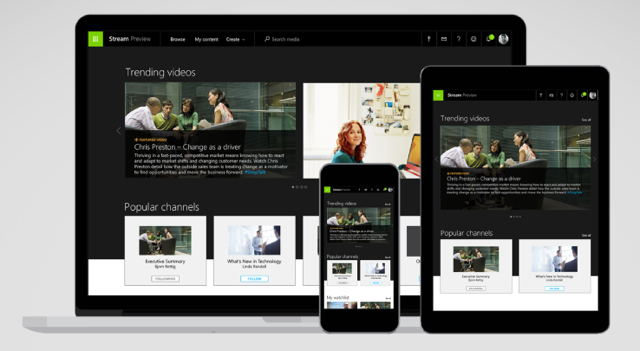 On Microsoft’s blog, Phillips notes that Stream provides drag-and-drop capabilities for video, shows trending videos to help discovery, lets the user watch video on any device at any time, and offers channels for following specific kinds of videos. Security is provided by Azure Active Directory, which Phillips describes on the blog as “a recognized leader in identity management systems.” He adds that the Stream team is studying the work of Microsoft research and the Azure Machine Learning teams, “to bring features like speech-to-text, automatic translations, and support for face recognition to future versions of Stream,” as well as, potentially, live streaming. In terms of security, Stream “treats videos … like any other digital artifact in the enterprise,” meaning the user can “assign rights to videos, set access groups, remove access, and ensure that videos aren’t shared outside of the company.” The Stream API allows developers to build new applications over time. “We believe our partners will take Microsoft Stream experiences to the next level,” says Phillips.